Happy New Year! You're reading issue #56. 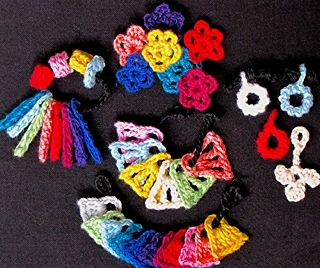 Would you expect to make buttons, flowers, and 1" squares from 36" lengths of yarn? I did, but kept running out of yarn too soon. I needed to stop wasting inches. Maybe this sounds crazy, or not fun? Stay with me though. I'm surprised by how addicting it is. My fantasy is to have a "designing keychain" that is as charming as a bracelet. 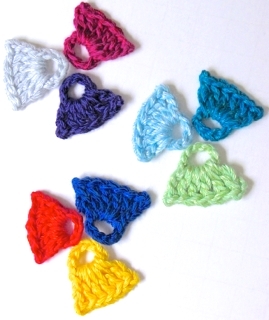 Each crocheted color "chip" can be held up to clothes in my closet, or other yarn colors. Each can be independently layered or tiled with other color chips (unlike, say, a striped scarf of 14 attached colors). Following are some ninja moves that squeeze more stitches from a yarn. We've probably all come up a bit short of yarn for a project so maybe you'll recognize some of these. 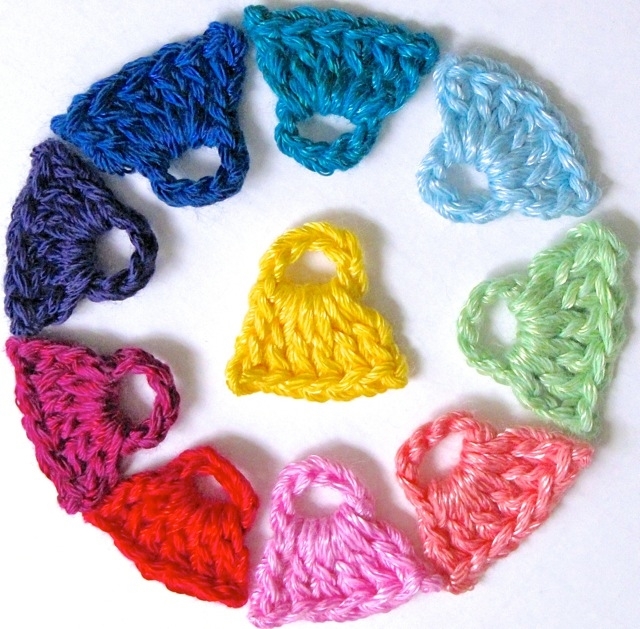 The one-yard flowers at right require lean centers; a chain-loop center takes too much yarn! Somewhat common strategy: Omit the beginning slip knot altogether, or unknot it later when weaving in the end. Include the yarn end in the foundation chs. I found a video of the way I do it: see the Youtube link at bottom of right column. Slip stitch to join or to fasten off? NOPE! Can't spare precious millimeters of yarn. Instead, I slip the slip - my name for when you remove the hook from your st and pull the lp through the place where you would have sl st'd it - like completing a classic popcorn. (Some antique sources called this a sl st...) See abbreviations at end of this column. 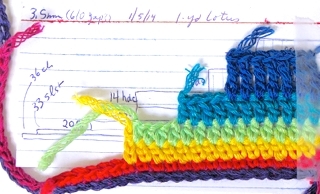 Low-fat picots: I might slip the slip that closes a picot. Or, merely hinting at a picot can work: ch 1, sl st in the back bump of the ch just made. (You could also call this a tight love knot.) The pastel tiles at left have fat-free picots in the corners. Abbrev's: ch=chain, lp=loop, sl st=slip stitch, st=stitch. These little color chips are coming in handy in my studio. I love that they double as jewelry charms! 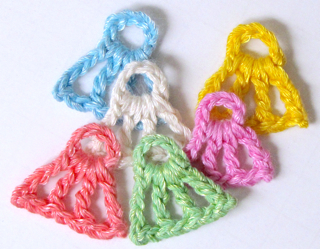 I'M GIVING AWAY LOTUS COLOR CHIP KITS to the first 25 US residents who purchase a pattern with this coupon link! After that, the kits will be available for the actual cost of materials & shipping: $3.15. 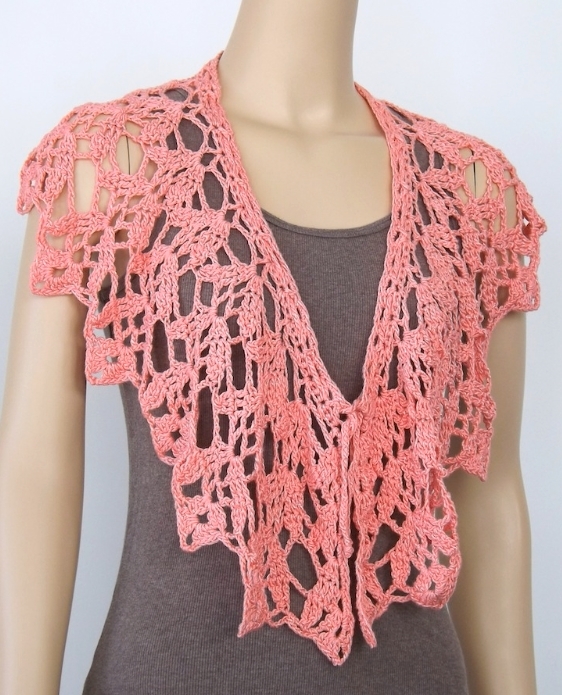 Corsair Collar from her Convertible Crochet book shown in Peachy Sheen Lotus yarn. You can see pal Diane Moyer modeling this collar here. "DJC2: Tank Girl Top," shown with tap pants as lacy pajamas in Junior size S (32"). In sapphire blue Lotus yarn. http://bit.ly/kRYBKs Pattern for the tap pants is coming soon! 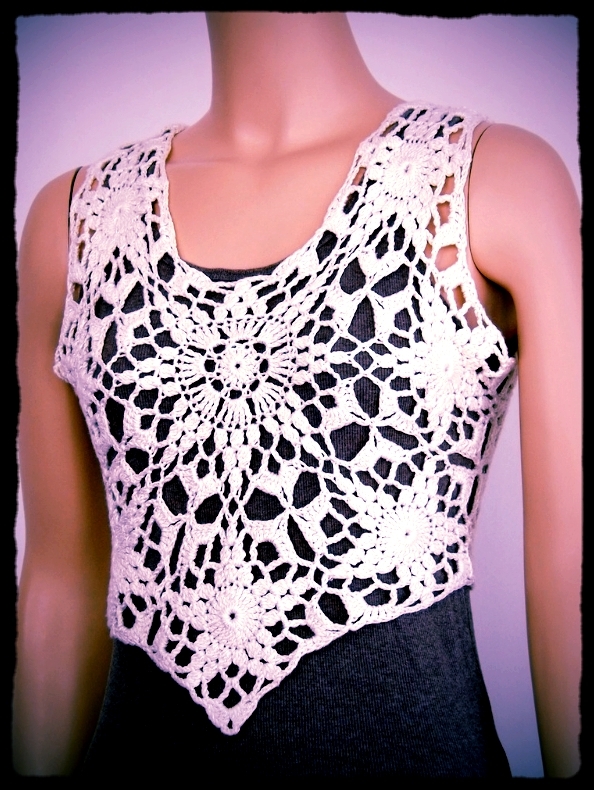 Doris' Callisto Top shown in Lotus yarn from her Convertible Crochet book. 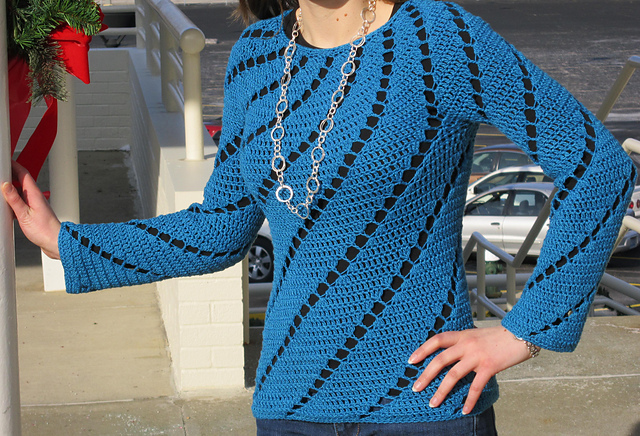 Omygoodness Look: Raveler LadyGryphon's Spirals Top in Lotus yarn!! Copyright (C) 2014 DesigningVashti Crochet All rights reserved.